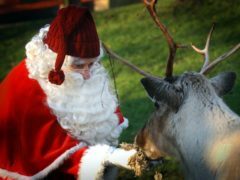 Rudolph the reindeer probably was not bullied for his crimson snout – because he and his fellow reindeer cannot see red. A North-east woman today hit out at the callous thieves who stole three light-up Christmas reindeer ornaments from her garden. A North-east policeman has stepped in to give Father Christmas a push after his sleigh got into difficulties this weekend.